"Intelligent Capture for Accounts Payable"
Intelligent Capture is catching the attention of organizations and causing a fundamental shift in the way businesses read and process paper and electronic documents. It eliminates the tiresome work of manual data entry and its associated errors, driving the return on investment in Accounts Payable automation. Intelligent capture software that includes document imaging, separation and classification of invoices, and data extraction and validation introduces integrity in the downstream AP processes. How can you implement an intelligent capture solution successfully? What are the business systems that an intelligent capture system is typically integrated with? What are the key areas in which an intelligent capture technology can further enhance the Accounts Payable process? 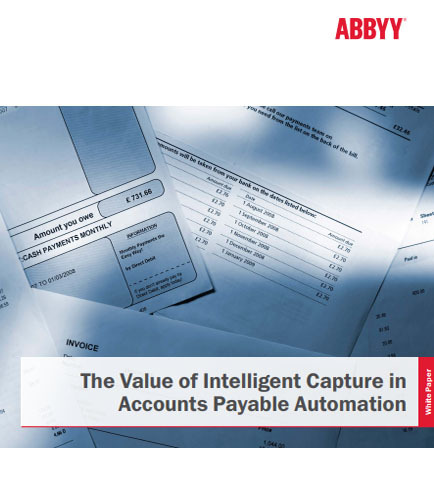 Download this white paper to learn why capture is important in your Accounts Payable automation initiative. For a majority of companies, from small and medium-sized businesses to large enterprises, migrating data center workloads to the cloud is rapidly becoming a key priority. However, organizations are struggling to perform server workload migrations and cloud on-boarding in a comprehensive, seamless and timely manner. They face obstacles in terms of the complexity of manual migration processes, how to migrate one workload type to another platform and the necessity to avoid cloud sprawl, to name a few. In addition, most customers' data center infrastructures are a complex amalgamation of systems with competing resource efficiencies. Often, these environments consist of physical servers with different operating systems, distinct virtualization and private cloud platforms, and myriad network and storage complexities. Moreover, manual server workload migration and cloud on-boarding is inherently difficult without the proper tools to help facilitate deployment. For making smart business process applications smart, we must create a proper information environment for knowledge workers. The biggest challenge faced by the organizations today is how to increase the productivity of their knowledge workers. This whitepaper outlines the intelligence and insight needed to make Smart Process Applications truly “smart” by providing the right information – exactly, to accelerate and improve results. It highlights: How to identify and extract events and facts between related entities with a high speed and comprehensiveness? How does a system determine the context with the precision necessary to empower efficiencies? How can the knowledge workers action their information throughout the entire process efficiently? Download this whitepaper to learn how to fully optimize the knowledge worker stack and make smart business process applications smart. What is accounts payable ? Accounts Payable involves the payments made to the supplier in a short period of time to avoid non-payment.We avail services such as electricity, the internet, and telephone for which we pay at the end of the month. It means that a customer is handed over the bill after a particular billing period. This turns out to be Accounts Payable. What is accounting software ? Accounting software is utilized by accountants and finance professionals to automate their manual workflow. Accounting software offers many benefits such as speeding up the information retrieval process, bringing competence in bank reconciliation processes, automatic preparation of Value Added TAX (VAT) / Goods and Services TAX (GST), and to provide opportunity to see the real-time state of the company’s economic ranking.